Police have confirmed that the Uzbek immigrant accused of killing eight and injuring 12 in New York City carried out the attack in the name of the Islamic State terror group. "He did this in the name of ISIS," New York deputy police commissioner John Miller said Wednesday. Miller added that the suspect "had been planning this for a number of weeks." The attacker is identified as 29-year-old Sayfullo Saipov, an immigrant from Uzbekistan. He came to the United States in 2010 through the Diversity Immigrant Visa Program, also known as the lottery diversity immigration program. Officials say Saipov drove a pickup truck down a bicycle path in New York City on Tuesday. Eight people died and 12 others were injured. He then ran down a highway, holding fake guns and shouting "God is great" in Arabic. Police then shot the man. He remains hospitalized in critical condition. Miller said that police found notes written in Arabic in Saipov's truck that said the Islamic State "would endure forever." Speaking from the White House on Wednesday, President Donald Trump called the attacker an "animal." He asked Congress to end the lottery program immediately and replace it with a merit-based immigration program. The diversity visa program provides up to 50,000 visas each year by lottery. Applicants must have completed high school or meet work experience requirements. The program was created as part of a bipartisan immigration bill introduced by the late Senator Ted Kennedy, a Democrat. It was signed into law by President George H.W. Bush, a Republican, in 1990. Earlier on Wednesday, the president called the diversity lottery program "a Chuck Schumer beauty." Schumer is a New York senator and the Democratic leader of the U.S. Senate. Trump also noted what an expert said on Fox News Wednesday, tweeting, "Senator Chuck Schumer helping to import Europe's problems." Shortly after Trump published his tweets, Sen. Schumer replied with his own: "I guess it's not too soon to politicize a tragedy." Schumer said in a statement that he has "always believed and continue to believe that immigration is good for America." He added, "I'm calling on the president to immediately rescind his proposed cuts to this vital anti-terrorism funding." Trump said on Tuesday that he ordered the Department of Homeland Security "to step up our already Extreme Vetting Program." Trump's extreme-vetting policy on immigrants aims to identify those who may sympathize with extremists or pose a security risk to the United States. My mate dived headfirst through a window and I ran down the hallway. Ten of the injured are said to be in critical condition. He urged donors to step up their efforts to send aid to Somalia. One of Kenya's leading churchmen has called on the government to resign. 5.Police have confirmed that the Uzbek immigrant accused of killing eight and injuring 12 in New York City carried out the attack in the name of the Islamic State terror group. Two independent studies have been carried out. Forensic experts carried out a painstaking search of the debris. 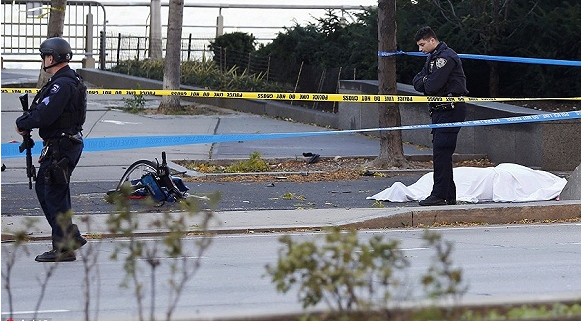 6.Police have confirmed that the Uzbek immigrant accused of killing eight and injuring 12 in New York City carried out the attack in the name of the Islamic State terror group. In the name of humanity I ask the government to reappraise this important issue. She accepted the gift in the name of the Save the Children Fund.